Huge Monitor , really need the Sound Anchor stands. These really are wonderful speakers. They do take quite sometime to set up but once you find that sweet spot it is magic! Listened to lots of other brands and keep coming back to Wilson and this was a model I could afford and enjoy! Some have complained that they are bright but i tell you they are not they will just show weaknesses of upstream components. Again Placement has alot to do with overall tonallity. * Unsurpassed clarity * Pinpoint imaging * Wide 'sweet-spot' for listening * Exemplary build-quality * High sensitivity - 94dB/1m * Allow electronics to shine through * Cheap for a Wilson speaker. * 4 Ohm load, or less, presents difficulties in bass reproduction for a low powered amp, so consider a sub-bass. * 19" weighted & isolated stands mandatory. * Expensive for any speaker but a Wilson. * Unforgiving of poor quality ancillaries, or poor room acoustics. I've owned CUBs for over six years, having purchased them after auditioning many competitors. They are exacting in terms of room acoustic, placement, and electronics, but when set they offer sound that rivals the very best on offer. With outstanding build quality, they would be a great second-hand proposition, mine having been entirely trouble free. * Wilson emphasize the importance of room acoustics in their instruction brochure. Certainly, it is critical with the CUBs. My experience saw the CUBs sing in certain rooms, and cry in others. 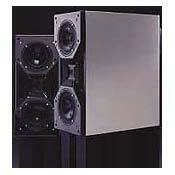 * In terms of sheer size, with their obligatory 19" stands, and 22" depth, they are larger than many floorstanders. In gloss black and with grills on they are reasonably innocuous aesthetically. They also demand being pulled from the wall, some 24" at least. * As for electronics, I've found tubes best for timbre and character, with 100wpc required for exemplary bass response down to 50Hz. That said, currently they are teamed with a Jadis Orchestra Integrated (KT90 tubes, 53wpc), and a REL StormIII sub-bass, and the results are absolutely wonderful. The CUBs do let the characteristics of the electronics come through, so a poor quality source is likely to be inadequate, and the tonal qualities of better products will be evident. With the above, and an Audio Reseach CD1, they are alive, natural, involving, and utterly non-fatiguing. Poor room acoustics, poor placement, or unsympathetic electronics would see all the well-publicized criticisms borne out, but then this would be true of any Wilson, even an X-2. * I liked the sound of Watt/Puppies, but could not afford them - this fact might be the best guide for a potential purchaser, because The CUBs definitely provide a good dose of the Wilson house sound, at a fraction of the cost. I'm tempted to list the many speakers I auditioned both at home and in the showroom, but in the end these won the day. They are a fairly sizeable chip off the block of the larger Wilson models. Junk. This is one of the WORST loudspeaekers I have heard. I demoed it at a local dealer in a $50000+ system, with a Krell / Classe / Audio Research front end and room treatments, and no matter what music was on, I could not turn the volume down fast enough. Finally, it sounded best when it was off. These speakers are BRIGHT, BRIGHT, BRIGHT. So much so, in fact, that everything else was lost on me. Whatever detail there was was drowned out by bad sound. I couldn't even listen to Beethoven's 3rd Symphony for God's sake. I cannot adequately describe how bad the experience was. And all this for what, $7000. Please. I'm giving the product one star only because I can't give it zero stars. Avoid this loudspeaker. Image well. Able to play at high SPLs with out driver compression. Very detailed. Need sub(they are a monitor you know). These are very well built monitor speakers that are very flat and unforgiving down to about 50 Hz. They need to be set up in a room with absorbing matterial behind and to the sides of the speakers and at the primary reflection points at the side walls as well as in the rear behind your listening position. Rugs and heavy furniture will also help. They sound much better in medium to larger rooms. This speaker is regarded as small and therefore I think people tend to think that it will work well in a small room with low amplification. It may fit better into a small room, but, it is critical that your room is big enough to allow you to sit outside the near field (12 feet away is fine.) If you do not set these speakers up this way, they will drive you nuts. They will beam at you and will sound bright. These speakers do not go much lower than 50 Hz. Wilson does not tip up the low end to compensate for lack of base response. Because of this they can sound very bright. They desparately need a good low destortion flat subwoofer. In my experience with these speakers I found that when I first set them up I disregarded all of the above recomendations. I hated them. They had no slam, they were bright and fatiguing. I couldn't understand how a speaker that sounded so detailed, had such a great sound stage, and sounded so great in the audio salon could sound so disapointing when I got them home. The salesman at Nuts about HiFi was a jerk after they sale, was of no help setting them up, and told me I needed to upgrade all of my "up-stream components". He did offer to sell me a $4,500 subwoofer and come out and set it all up for an additional 200 bucks. At this point I was pretty discouraged. Well, as I finished my listening room, I was able to move them back to a distance of 12.5 feet (from about 7.) Suddenly I had fantastic imaging and the brightness dropped off to non-fatiguing but not perfect. Next came the wall treatments and I gained some clearity and lost more of that apparent brightness. I was getting much happier with my purchase and I was feeling as though they actually had some slam. Lastly, adding the Velodyne HGS-18 made all the difference. It took away all of the last bit of brightness and had the effect of smoothing out mid and high end. I was able to stop rolling off the high end with my processor. These speakers now kick! They are extreamly detailed and have a pin-point sound stage that is huge. Female jazz vocals are silky and clear and not overly bright as they were before. There is no longer overwelming brightness, just crystal clear music. The Eagles drumming really kicks and has great slam. I am very happy with them. One note about amplification. I know that these speakers are rated as very sensitive with something like 97dbl at one watt. But I will tell you that they like to be controlled with a lot of current. For example, you can clip my amp at 105 db at the listening postion. I have a Cinepro 3k6seII that is running off a 240 volt, 30 amp service. It can put out 770 watts into a 4 ohm load. These speakers can drain a lot of current. (I don't listen at this level, but it does tell you something about these speakers). All I can say is that when driven with some substantial power these speakers sound unbelievable for what they are. I think some of these considerations may be why this speaker gets reviewed as bright. I like the speaker when set up this way. I will use them as my front stereo mains and as the front 3 speakers in my home theater until I can move them to the sides in my 7.1 system. Then I will up-grade to Revel Ultima or WattPuppy 6.1 or something like that. The Cubs are great and I love them, but they aren't quite in the ballpark with great full range speakers, but that isn't what they are. And they aren't supposed to be a mini speaker either. They are a flat, satalite-like speaker that wants to be set up like a larger speaker except they need a good sub, and they demand a larger amp to really get cooking. They are just that and they do quite well in that regard. Very accurate speaker with brigh imaging. Purchased Cubs after hearing them several times in stores over an extended time period. Both stores I heard these speakers in had small rooms with rather dead sound. Speakers were impressive. In my set up, with Krell monos, Wadia CD, and Transparent Interconnects and Speaker cables, they were ok, but far from great. Could have had something to do with the set-up (which was admittedly less then perfect) and most likely had much to do with the big, very hard, open room I had them in. Could not get any low end to speak of without having volume up very high. They were accurate but really would only do well with jazz and some classical music applications. Perhaps I should have tried some of the suggestions others made, tube amplification to start, but it was only a bandaid on a serious deficency of these speakers. These speakers would do well as rear channels in a a/v set up. Not my cup of tea for your primary listening if you are into a broad range of music. Traded them in for new speakers less then two months after buying them. Oh well. I have had a pair of Cubs with the target stands for a couple of weeks now. Wonderful imaging and an uncanny ability to have great bass response. Preamp and a Sony CDP-90ES changer, these speakers sound wonderfully smooth. But, get a kidney belt and a hand cart if you want to move them around. Very Heavy. few days later and gave the CUBs a listen, I bought them that day! Wow!!! !What a lot of sound from a mini-monitor!Dynamics are first rate - a forward sound made my recordings kick!! Large, open soundstage. I didn't know a small speaker could do this! A little bright - not as smooth as my Dunlavy SCIV's - might be fatiguing after a long time. Very expensive for a mini-monitor. Still, 4 stars for the over-achievement! I thought I would submit a follow up review nearly twelve months later. I have not bought the cubs yet. I was very close to a purchase until I went back east and heard them in a very different set up then I had previously heard these speakers in. The system this time was Meridian CD player w/ Audio Research Equipment. The speaker was harsh and bright. It froze me in my tracks. and very boreing. My ears hurt after more than one hour of listening. prepared for the shock....they are simply extraordinary AWESOME !!!!!! !